Fashion your dining or bar area with the Jovan Collection for a casually refined dining assortment for your home. 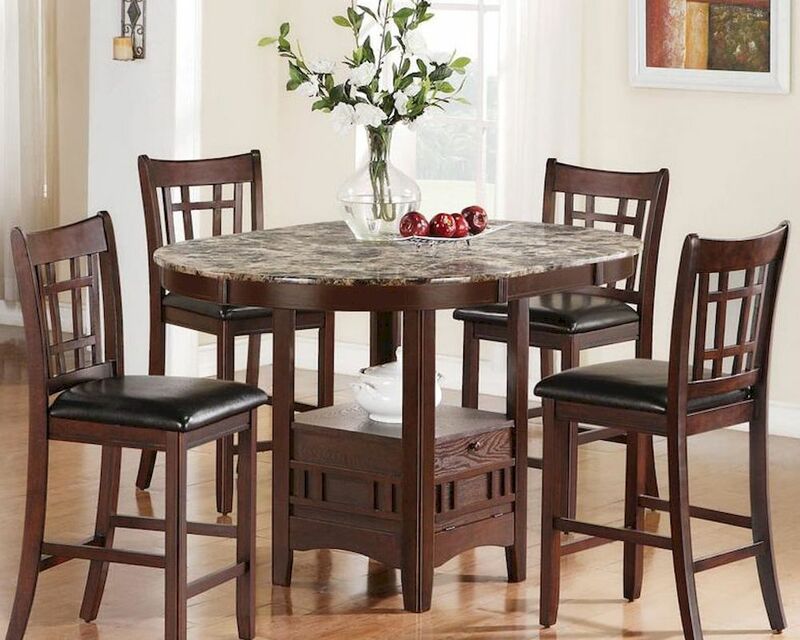 It features counter height pieces in a rich brown finish, offering warm tones to enliven in your dining space. 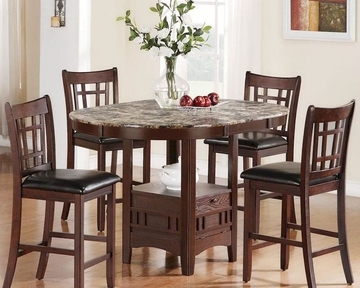 Outfit your dining area with the Jovan 5-Piece Pub Set. The table is simple and stylish with an oval table top, providing plenty of dining space. A faux marble top adds character and classy charm, contrasting perfectly with the rich brown woodwork on each piece. The table is lifted on a four legs with a center storage base in between, perfect for placing dining accessories, dishes, and home accents. Accompanied are four matching counter height stools. A checkered chair back adds visual depth and dimension, and a dark vinyl cushion seat offers comfort. Lifted on four legs, the back two which gently curve outward, stretchers provide additional support. Transitional in style, the Jovan Pub Sete is ideal for smaller size rooms looking to maximize their space. Counter Stool - 20"L x 18"W x 41"H; Seat Height - 24", Seat Depth - 17"